GOLETA, Calif., Jan. 16, 2019 (GLOBE NEWSWIRE) -- Management from Resonant Inc. (NASDAQ: RESN), a leader in transforming the way radio frequency, or RF, front-ends are being designed and delivered for mobile handset and wireless devices, will present at the 21st Annual Needham Growth Conference an updated investor presentation that includes a first look at the company’s expectations for 2019. “We believe 2019 will be a breakout year for Resonant, building upon our expansion in 2018. We anticipate our company KPIs to grow year over year by an average of 40%, with a range of 14% to over 100%,” stated George B. Holmes, CEO of Resonant. “We expect to accelerate the ramp of our royalty revenue through the course of 2019 as we continue to deliver against our key milestones. We are working closely with our customers to provide designs for products that they intend to sell not only today but for multiple years in the future. “Ongoing and deepening relationships with our customers enable us to stay on top of, and at times in front of, the needs of the RF front-ends (RFFE) industry. An example is Resonant’s development of our cutting-edge 5G XBAR-based filters, which we expect to demonstrate at Mobile World Congress in Barcelona next month and make available for licensing later in 2019. If successful, BAW and XBAR will be an additional key driver to our growth starting late in 2019 coinciding with 5G deployments. “In 2019 we also expect to add to our Filter IP Standard Library, which we rolled out with an initial quadplexer solution in December of last year. Developed in collaboration with our foundry partners, the solutions licensed through this program will enable our customers to enter the RFFE market quickly with proven designs that further reduce time to market, which is critical in this fast-moving industry. We expect the increased scope of the standard library, which will include XBAR based devices targeting 5G, will further expand our potential customer base, and should positively impact our growth prospects. The presentation will be webcast live and available for replay following the live presentation. The webcast can be viewed at https://ir.resonant.com/events and the investor presentation can be accessed at https://ir.resonant.com/presentations. 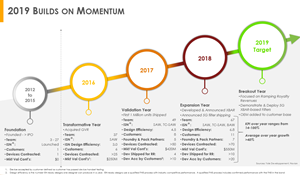 This press release and the investor presentation contains forward-looking statements, which include the following subjects, among others: the status of filter designs under development, the capabilities of our filter designs and software tools, the timing and amount of future revenues, our views on future financial performance and market share, and other KPIs for 2019. Forward-looking statements are made as of the date of this document and are inherently subject to risks and uncertainties which could cause actual results to differ materially from those in the forward-looking statements, including, without limitation, the following: our limited operating history; our ability to complete designs that meet customer specifications; the ability of our customers (or their manufacturers) to fabricate our designs in commercial quantities; our customers’ ability to sell products incorporating our designs to their OEM customers; changes in our expenditures and other uses of cash; the ability of our designs to significantly lower costs compared to other designs and solutions; the risk that the intense competition and rapid technological change in our industry renders our designs less useful or obsolete; our ability to find, recruit and retain the highly skilled personnel required for our design process in sufficient numbers to support our growth; our ability to manage growth; and general market, economic and business conditions. Additional factors that could cause actual results to differ materially from those anticipated by our forward-looking statements are under the captions “Risk Factors” and “Management’s Discussion and Analysis of Financial Condition and Results of Operations” in our most recent Annual Report (Form 10-K) or Quarterly Report (Form 10-Q) filed with the Securities and Exchange Commission. Forward-looking statements are made as of the date of this release, and we expressly disclaim any obligation or undertaking to update forward-looking statements.